hotels in Vilnius and it is also quite a popular hotel in town. Atrium hotel is ideally located in the heart of the main pedestrian street of the Old Town. 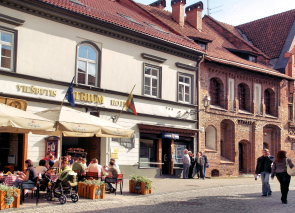 Next to some of the liveliest Vilnius’ cafes and restaurants, designer shops and bars. In summer time you can sit at a pavement cafe outside the hotel and watch people promenade up and down Pilies Street. 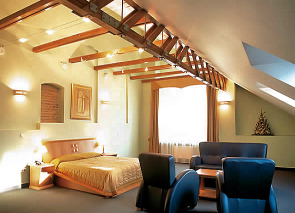 The hotel is set in a renovated building of XVI century. Decorated in a tasteful minimalist style the rooms look sleek and classy. Atrium provides all modern comforts like cordless phones, in room safes, minibars, heated bathroom floor, free wireless Internet and satellite TV. They also offer facilities for handicapped people. Single and standard rooms are nice, but not exceptional. So if you are looking for real luxury go for the suites and apartments, which are particularly spacious and appealing, with some of them taking up two floors. Furnished with dark blue leather couches and king size beds the rooms are very comfortable, high ceilings add to the airy feel of the rooms. Hotel services include airport shuttle, car rental, laundry, dry cleaning, conference rooms, free car parking (arranged in advance), luggage storage and ticket booking. On the lower floor of Atrium hotel guests are welcome to use their modern relaxation complex with a sauna, Jacuzzi and a small hall for meals next to it. The fee for the sauna complex and banqueting room is 44 € per hour. The hotel’s central location provides numerous eating possibilities, however, downstairs they offer their own excellent Argentinean restaurant El Gaucho Sano . It is one of the most loved restaurants in town and also among our favourite listed. It has an old, informal cowboy style theme and offer some of the best steaks in Vilnius. 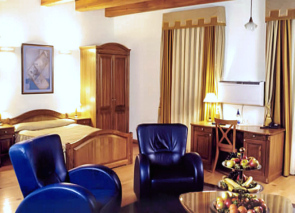 The hotel offers a special room for disabled people, the restaurant and public area is accessible for wheel chairs. Be aware of occasional people noise coming from the street, as this is one of the main pedestrian streets. If you wish to read other people’s reviews who stayed at the Atrium Hotel, check out room rates and available booking dates, click on the link below.